Extending the Millennium Line SkyTrain to UBC will contribute to a growing transit network that meets the needs of the entire region, reducing congestion, moving people more quickly and safely between their homes and places of work, and minimizing our impact on the environment. It will also increase access to education and affordable housing options, and encourage economic growth and prosperity throughout the region. UBC is one of the region’s busiest transit destinations, with over 1,000 buses per day, most travelling along the congested Broadway corridor. This massive volume of bus traffic is clogging things up, causing long, slow commutes for people who use the Broadway and adjacent corridors and lower productivity for businesses in the area. The Broadway Subway project—extending the Millennium Line SkyTrain to Arbutus Street—is an important start, but falls short in meeting the long term needs of the corridor. Buses from Arbutus St. to UBC will continue to be overcrowded and transfer times will limit project benefits. TransLink’s analysis suggests that on opening day of the Broadway Subway, pass-ups and overcrowding will continue to be the norm on the B-Line from Arbutus to UBC. Fast, frequent, high-capacity SkyTrain service all the way to UBC is essential if we want to mobilize people, lower commute times and reduce congestion. The university has established an aggressive sustainable mode share target of 66.6%. Participation in the successful U-Pass program has resulted in 52% of trips to/from campus by transit. A new state of the art bus exchange is under construction. This will improve both operations and the transit user experience for more than 80,000 daily transit trips. UBC is constraining parking supply and leveraging new technology to make the most of the spaces that exist. The university is investing in cycling infrastructure and partnering with carshare providers to increase transportation options. UBC is piloting an on-campus bike share program to make it easier for people to get around campus and access existing transit services. The university is supporting decarbonization through increased EV charging infrastructure. But this is not enough. Transit is over capacity, and people are getting passed up every day. Without a reliable, fast, and comfortable transit option, people are returning to their cars. TransLink and the Province of BC explored several options for serving the Broadway corridor between UBC and Commercial Drive in the UBC Line Rapid Transit Study (2009-2012). They compared the costs and benefits of Bus Rapid Transit (BRT), Light Rail Transit (LRT) and Rail Rapid Transit (RRT or SkyTrain) options. RRT-SkyTrain scored the highest on every front: travel time savings, mode share change, economic growth, community benefits and GHG reductions. 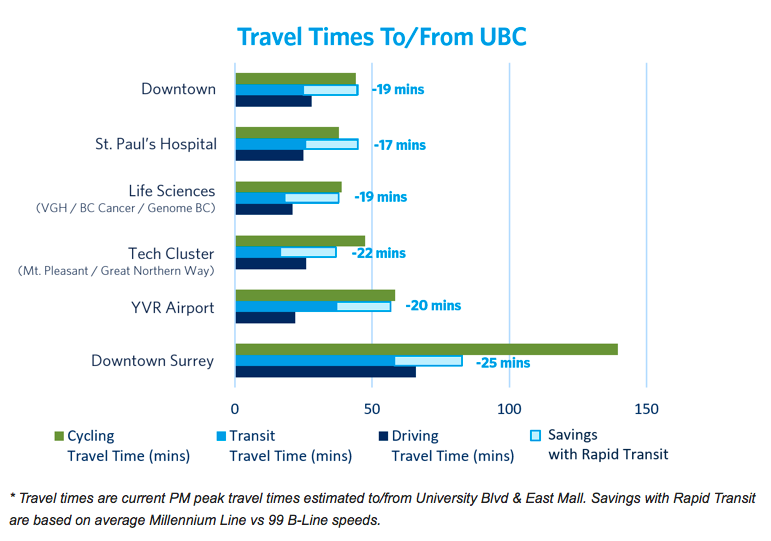 In almost every case, SkyTrain to UBC will reduce transit times below those of a car during PM peak travel times. These time savings will improve life for commuters and help get more cars off the road, further reducing congestion and GHGs. SkyTrain is the only technology with room to meet future demand along the corridor beyond about 2045, especially if the region is successful in achieving the TransLink target of 50% of all trips by sustainable modes by that same time. It’s anticipated that by 2045 there will be just under 119,000 daily boardings on SkyTrain between Arbutus and UBC. SkyTrain is the most cost-effective transit option. It attracts more riders and saves people more time. As an automated system with high capacity vehicles, cost per rider is lower than smaller BRT and LRT vehicles with drivers. Running underground or on an elevated guideway, SkyTrain does not interfere with traffic. At-grade alternatives create ongoing impacts, including turning and pedestrian crossing restrictions. Faster, more reliable and better integrated with the broader network, SkyTrain attracts more riders. This maximizes benefits and will help achieve mode share, environmental and economic targets. LRT is not cost-effective in the long term. Travel time savings would be minimal relative to B-Line buses since LRT vehicles still interact with traffic at intersections, reducing their speed, and passengers would still need to transfer to access the rest of the SkyTrain network. LRT vehicles would be at capacity about a decade after opening without the ability to expand. LRT is not a long-term solution. Since LRT uses part of the road right-of-way, it would contribute to traffic congestion and increase auto travel times, negating some of its benefits. The need for additional property acquisition and construction of an LRT Operations and Maintenance Facility reduces the potential cost savings of LRT relative to SkyTrain. Compared to SkyTrain, LRT from Arbutus to UBC would be roughly two thirds of the cost, but deliver only about a quarter of the capacity and attract less than a third of the ridership in 2045.